Hello! This is my first post in eons! But I am going to try once again to get back to blogging, and this post is a fairly easy one! 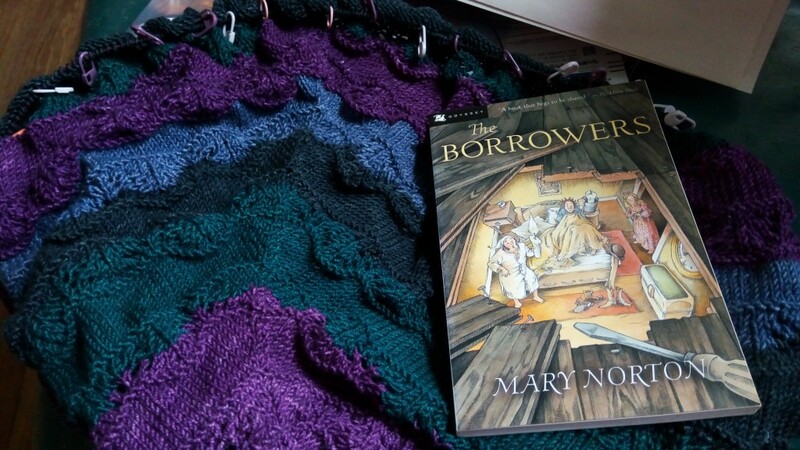 I am sharing what I am knitting, and what I am reading! I am knitting Shaelyn. It is a fairly simple shawl, but I wanted something that would work well with the self striping yarn that I am using, and something that I could actually get done in a reasonable amount of time! I missed Christmas, as I had a couple rather large trips to the frog pond that set me back, but I am back on track, and doing pretty well! I am reading The Borrowers. It is a book that I read many times in my childhood, and I was just in the mood for a light and easy read! I am excited to be back to blogging, as well as being creative. I am hoping to stay on track with both! Wow! That’s self-striping? It’s beautiful. And it really looks great with the pattern you choose. It is “Broad Band” supersock self-striping by Cherry Tree Hill. I spent some time looking for a pattern that would not be overwhelmed by the broad stripes/strong colors, glad its working! that yarn is perfect for that pattern…how pretty!!! welcome back to the blog-world!! !